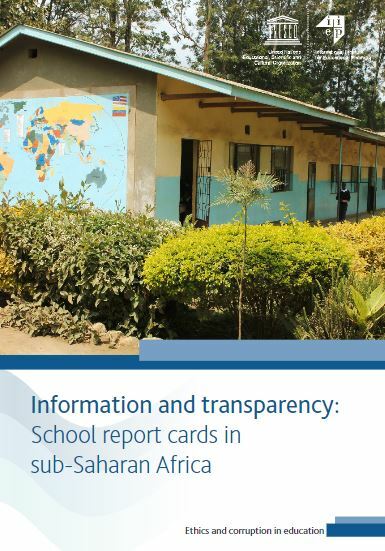 A new publication from IIEP-UNESCO investigates the use and impact of school report cards in sub-Saharan Africa as a means to promote transparency and accountability while keeping corruption at bay. With the financial support of the French Ministry for Europe and Foreign Affairs, the book reviews 21 initiatives in 13 sub-Saharan African countries. Also available in French, it documents where school report card initiatives are taking place, how effective they are, and what factors are key to their success in keeping the flow of human, financial, and material resources in check. The book is based on a detailed literature review on the subject, with added insight from a survey of managers of seven school report card projects in both English- and French-speaking African countries. A system for making public a set of aggregated data specific to an individual school. In sub-Saharan Africa, donors or local or international non-governmental organizations (NGOs) often first launched a school report card initiative. The book presents two different approaches to school report cards. The first is an administrative model, where a ministry or other government body publishes school-level data on a public board or via the internet. While it is open to the public, the school community often does not know how to effectively use the data after viewing it. The second approach is known as the participatory model. In this case, school report cards are normally launched by civil society and are used as a tool for dialogue with the larger school community. With a more bottom up approach, the wider public is encouraged to use the data to influence how public resources are allocated and used. The book analyzes cases where school report cards have led to improvements with a country’s educational management information system (EMIS), school management, teaching practice, learning outcomes, supervision, but also community mobilization, teacher absenteeism, and reporting of corruption. It explains how the achievement of such outcomes is heavily dependent on how school report cards are designed and implemented. The book concludes that publicizing school resources through a report card available to the school community – including head teachers, teachers, and families – can become a powerful way to enable citizens to exercise greater control over the transfer and spending of public money. 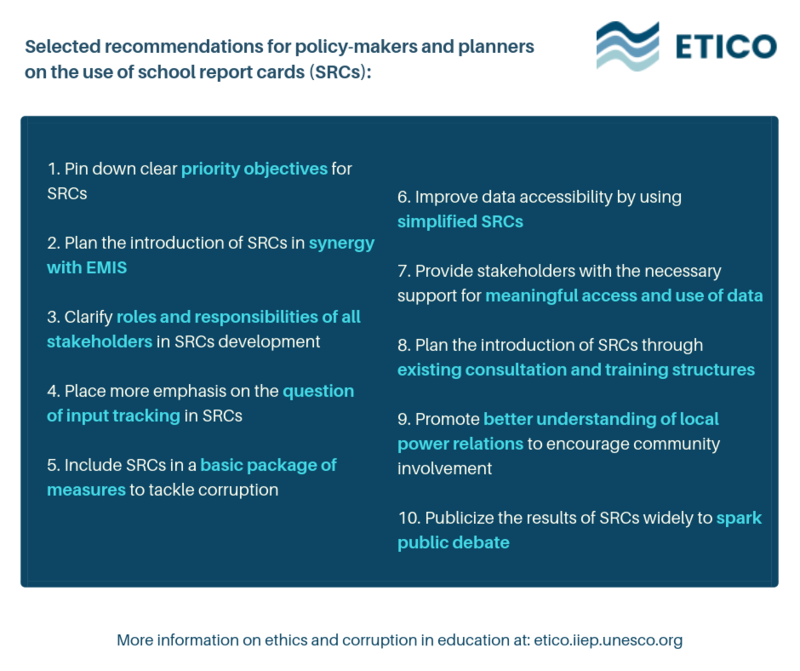 Recommendations for policy-makers on how to better integrate corruption control measures into the use of school report cards are also provided at the end of the book. This book is the latest addition to IIEP’s research on ethics and corruption in education. The project’s main objective is to improve decision-making and the management of educational systems by integrating governance and anti-corruption concerns into planning methodologies and the overall administration of education in both developing and industrialized countries. Previous publications in the series covered in particular school financing, pro-poor education incentives, teacher codes of conduct, textbook production and distribution, and academic fraud. Download the book on school report cards. For more information, please visit our ETICO portal.